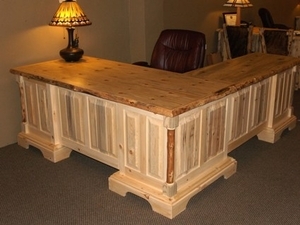 The majestic beauty of this executive desk will make your work day a little warmer. Hand crafted individually for a truly unique piece, Made in the USA. Shown with optional log columns (extra) in Pine/Natural. Available in Pine or Alder (extra) wood with Natural Clear Finish (standard) or Golden Pecan Stain (extra).� See our wood finishes. Click here to see our drawer pulls. Fifty percent deposit is required when ordered, and the balance is due upon shipment. Items are shipped curbside via freight carrier, though some smaller items can ship UPS or FedEx. Items are built to order in most cases, so lead time is generally around eight to ten weeks. Please inquire about expedited orders or specific shipping needs. Free standard shipping to contiguous 48 states, please inquire about quotes to Alaska, Hawaii and Canada.